JOHN BROWN. Endorsement Signature on verso of Syracuse City Bank check filled out and signed by GERRIT SMITH to “Pay Captain John Brown of Kansas or bearer, fifty Dollars.” May 16, 1857, 2 pp. 7.6 x 2.6 in. In 1846, Gerrit Smith purchased 120,000 acres of land in the Adirondacks, centered around North Elba, New York, specifically to settle African Americans on the land. In April 1848, John Brown went to see Smith at his Peterboro, New York, home, where they quickly formed a friendship over their shared hatred of slavery, concern about the welfare of free blacks, and deep religious faith. 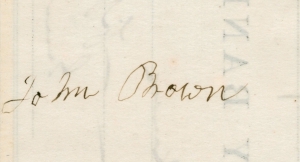 Brown possessed a strong desire to take overt action against slavery. He bought a 244-acre tract from Smith for $1 per acre and settled his family at North Elba in May 1849. In 1855, Brown followed five of his sons to the Kansas Territory to assist antislavery forces struggling for control there. With a wagon laden with guns and ammunition, Brown settled in Osawatomie and soon became the leader of antislavery guerrillas. On May 24, 1856, Brown led a small force including four of his sons on a nighttime retaliatory raid (three days after proslavery Missourians sacked the town of Lawrence). They dragged proslavery men from their cabins north of Pottawatomie Creek and hacked them to death with swords. Brown returned to Springfield, Massachusetts, in November 1856, and began raising money for more anti-slavery activities. Introduced to several influential abolitionists in the Boston area in January 1857, he began drawing cash from them. Four months later, Gerrit Smith gave Brown $50 to support his efforts to make Kansas a free state. Brown returned to Kansas with some armed men in November 1858, but because the October elections had largely elected free-state candidates, Kansas was quiet. Brown and his men returned to Iowa, and Brown left them there while he traveled to Rochester, New York, to meet with Frederick Douglass. On February 22, 1858, in a meeting at Gerrit Smith’s home that lasted late into the night, Brown revealed to Smith and Franklin Sanborn his plan to raid a federal arsenal to spark and supply a massive slave uprising. Smith was immediately supportive, and Sanford (who additionally represented four Boston-area abolitionists) agreed a few days later. With financing from the “Secret Six” wealthy abolitionists—Smith, Sanborn, Thomas Wentworth Higginson, Samuel Howe, Theodore Parker, and George Luther Stearns—in May 1858, Brown took the next step, convening a meeting of blacks and whites in Chatham, Ontario, at which he announced his intention of establishing in the Maryland and Virginia mountains a stronghold for escaping slaves. In the summer of 1859, Brown set up a headquarters in a rented farmhouse in Maryland, across the Potomac River from the largest federal armory, in Harper’s Ferry, Virginia. With an armed band of 16 whites and 5 blacks, on the night of October 16, Brown quickly took the armory and rounded up some sixty leading men of the area as hostages. Brown held out for a day and a half, fruitlessly waiting for hordes of enslaved people he expected to join the rebellion. On October 18, Lt. Israel Greene (under the overall command of Colonel Robert E. Lee) led ninety U.S. marines in storming the engine house; four of Brown’s men and two marines were killed. Brown and all of the remaining raiders were captured. A wounded Brown was tried for murder, slave insurrection, and treason against the state. After a seven-day trial, he was convicted, and hanged on December 2, 1859. After the raid, Senator Jefferson Davis attempted to have Smith and the other members of the Secret Six arrested and tried along with Brown. Smith may have suffered a mental breakdown and had himself confined to an insane asylum in Utica, New York, for several weeks. Three other members fled to Canada, and one remained in Europe. In 1865, the Chicago Tribune claimed Smith knew in advance of Brown’s plan to seize the arsenal at Harper’s Ferry and had feigned insanity to avoid prosecution. In response, Smith sued the paper for libel, but the newspaper published an affidavit by one of Brown’s sons that Smith knew of the plan to incite a slave rebellion. After two years of legal maneuvering, the newspaper published a retraction in 1867. Ironically, that same year, Smith posted $100,000 in bail to obtain the release of former Confederate President Jefferson Davis from prison until he could stand trial. John Brown (1800-1859) was born in Connecticut but grew up in Ohio. At age 16, he studied in Connecticut to be a Congregationalist minister, but he ran out of money and had trouble with his eyes. He pursued various businesses in Pennsylvania and Ohio. After the death of Elijah P. Lovejoy at the hands of anti-abolitionists in 1837, Brown publicly vowed to “consecrate my life to the destruction of slavery!” Brown moved to Kansas in 1855, to help anti-slavery settlers protect themselves. That May, Brown and other abolitionist settlers killed five pro-slavery settlers. In November, Brown returned to the East and spent two years raising funds in New England and developing a plan for a direct strike against slavery. In October 1859, he led a group of 21 men to Harper’s Ferry, Virginia, where they briefly seized the federal armory before local citizens trapped Brown and his men in a fire engine house before the arrival of U.S. Marines. Four of Brown’s men were killed, and he was wounded and captured along with the rest of his men. The commonwealth of Virginia tried and convicted Brown of murder, slave insurrection, and treason. He was executed on December 2. Six other raiders were executed later. The 1859 raid made him a martyr to the antislavery cause and was instrumental in heightening sectional animosities that led to the American Civil War. Gerrit Smith (1797-1874) was born in New York and graduated from Hamilton College in 1818. He managed his father’s substantial estate in Peterboro, New York, and increased the family’s fortune. In 1840, Smith helped organize the Liberty Party, an early advocate of the abolitionist cause. In 1848 and again in 1856 and 1860, he was the Liberty Party’s candidate for President. He served in the U.S. House of Representatives from 1853 to 1854 as a Free Soiler. As a philanthropist, he gave away more than $8 million, including land to indigent families, both black and white, and he contributed funds for the legal defense of persons accused of violating the Fugitive Slave Law. He became a leading supporter of the Kansas Aid Movement that aided anti-slavery settlers to that territory. Through these efforts, he first met and supported John Brown. In 1859, Smith joined the Secret Six, abolitionists who supported John Brown’s plan to establish a haven for runaway slaves in the mountains of Virginia. $50 Syracuse, May 16th 1857.